**Christian Morality: Our Response to God's Love has been submitted to the Subcommittee on the Catechism, United States Conference of Catholic Bishops. Declarations of conformity with both the Catechism of the Catholic Church and Doctrinal Elements of a Curriculum Framework for the Development of Catechetical Materials for Young People of High School Age are pending. 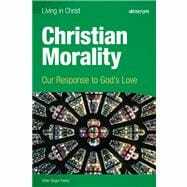 Christian Morality: Our Response to God's Love Students face countless choices and challenges in their daily lives. This course addresses how a relationship with Christ and the Church can lead to choices that are in accord with God's plan. The students learn what it means to live as a disciple of Christ and how the Church strengthens this discipleship. The Living in Christ Series Makes the most of the wisdom and experience of Catholic high school teachers as they empower and guide students to participate in their own learning. Engages students' intellect and responds to their natural desire to know God. Encourages faith in action through carefully-crafted learning objectives, lessons, activities, active learning, and summative projects that address multiple learning styles. What you will find . . . Each Living in Christ student book is developed in line with the U.S. Bishops' High School Curriculum Framework and provides key doctrine essential to the course in a clear and accessible way, making it relevant to the students and how they live their lives. Each Living in Christ teacher guide carefully crafts the lessons, based on the key principles of Understanding by Design, to guide the students' understanding of key concepts. Living in Christ offers an innovative, online learning environment featuring flexible and customizable resources to enrich and empower the teacher to respond to the diverse learning needs of the students. The Living in Christ series is available to you in traditional full-color text and in digital textbook format, offering you options to meet your preferences and needs.